In case you thought category design was just a discipline for the business world, in today’s “Playing Bigger” update we bring you a story of the courageous category designer, Bianca Valenti. Bianca is defying all prior human endeavors to crack the glass ceiling on big wave surfing for women, and is creating a new category in the process. October 28, 2017 was a watershed moment in surfing. A giant storm in the Aleutians generated a titanic swell that travelled 2,000 miles to the North Shore of Maui. When this swell hit the reef at Pe’ahi Hawaii (aka “Jaws”) it created waves in the 40-50 foot range. And waiting for these monsters were six women competing in the 2nd Women’s Pe’ahi Challenge. One of the surfers in the competition travelled from California’s Silicon Valley with much more than a surfboard. Her name is Bianca Valenti, and she came to this competition with a plan and vision to create the new category of Women’s Big Wave Surfing. A small group of elite women joined Bianca in her quest to make big wave contests open to all athletes who would dare paddle into a wave taller than a three-story building. So, why was this a category-defining event? Well to understand that, you have to understand the economics of professional surfing, namely that athletes and the surfing community need sponsorship dollars to be sustainable. Traditionally, men riding big waves have brought in the dollars. But, the World Surf League needed to expand into the next generation of customers to help grow sponsorships, ad dollars, and viewers. Bianca worked tirelessly to create the demand for the World Surf League to include women in their competitions. This was a huge challenge because big waves are a limited resource and a privilege to surf. Big swells like Jaws only happen for a few hours, a few days a year. Those special hours historically have been dedicated to only men’s big wave events, so Bianca had to convince the World Surf League that women surfers could and should have a shot at those precious resources. On that historic day, Bianca took off on a 40-foot bomb in her 9’6” Rhino Gun and rode it safely to the channel. 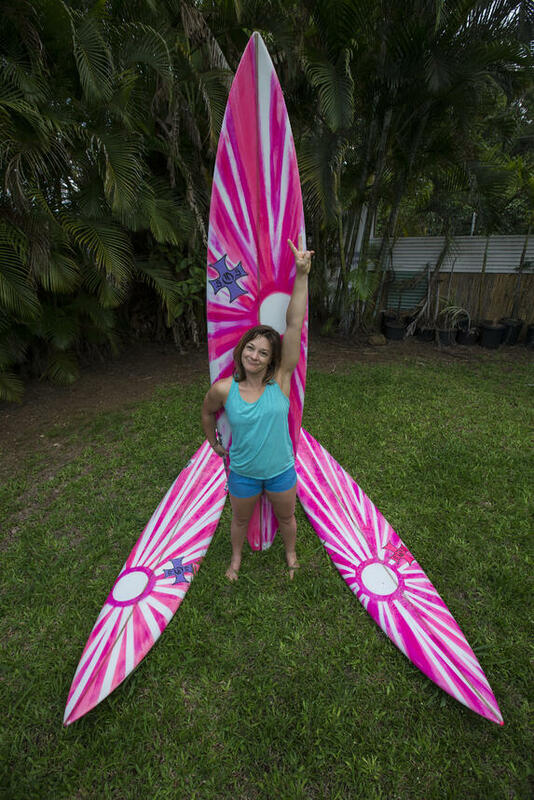 On that wave, the line between men and women vanished and it was just her ripping past circling helicopters, a flotilla of spectator boats, life-savers on jet skis, and millions of spectators watching the live webcast in astonishment. We salute not just Bianca, but also Paige Alms (who won the competition), Keala Kennelly, Justine Dupont, Andrea Moller and Felicity Palmateer. These pioneers pushed the limits of women’s surfing and therefore created new opportunities for sponsorships and advertising, which is the life-blood of the professional surfing business. Now the door is open for women in big wave surfing, and perhaps if you want to close it, you might have to paddle out and join Bianca in the line-up at Jaws to explain why. You can read more about Bianca’s journey in THIS GREAT article. Congrats! We are proud to be associated with you and all the women playing bigger in sports, in business, and in life. One day we had a big ah-ha moment. If Captain Jack Sparrow was right* – the problem is not the problem, the problem is your attitude about the problem - then let’s celebrate some of the world’s greatest problem solvers with the Play Bigger brand. You might recognize some of these legends like Clarence Birdseye, who solved the problem of getting fresh vegetables out to the masses in the 1920s. Others, you might never have heard about, like Gary Vermeer who made it easier for farmers to feed their livestock with his one-man hay bailer (now commonly known as the round bailer). Since we founded Play Bigger in 2011, we have had the honor to work with many pioneers in category design who want to change the way the world works. Like Vivek and Kris at Clover Health who are fixing America’s healthcare experience problem. And Adam, Will and Diego at Clear Metal, who want to solve the problem of shipping half empty cargo containers around the world. Or Mahe and Hari at Phenom People, who want to make recruiting talent no different than recruiting sales prospects. Or Lawrence and team at Double Dutch, who believe that it’s time to move events from the dark ages to the world of Live Engagement Marketing. We are also amazed to see companies from around the world using the Play Bigger book to adopt category design into their businesses. Every week we hear another new story about how the book is changing the way people are thinking about the problems they solve with their companies and products. The category design ecosystem has also expanded to include a network of investors, strategists, and advisors including our friends at Sequoia Capital, Accel Partners, Floodgate, Bullpen Capital, Goldman Sachs, Morgan Stanley, 1185 Design, Gold Front, Category Design Advisors, and Out Position. We hope that you enjoy our homage to the legends of category design! *Full disclosure: Captain Jack Sparrow’s meme pirated that quote from Ann Brashare’s book “The Sisterhood of the Traveling Pants”.